Earthquake damage from a previous New Madrid Fault quake. Move over California. The San Andreas fault ain’t the only game in town. Beginning June 24, the New Madrid Fault – the seismic zone that runs under the Mighty Mississippi and the Wabash River Valleys – is showing signs of life. 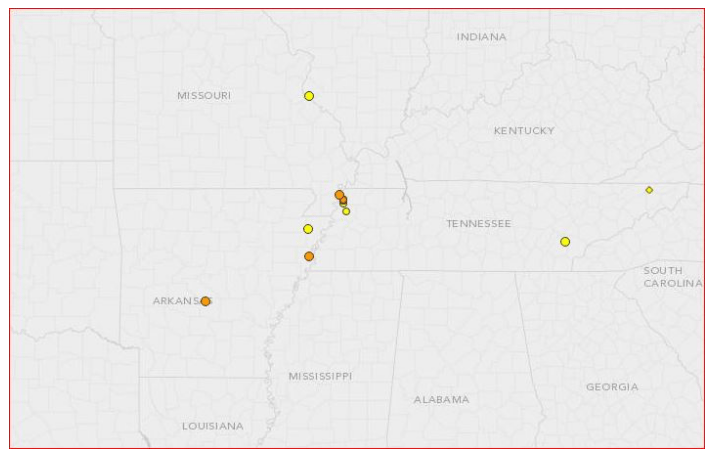 In a 24 hour period, fourteen earthquakes mostly centered in Tennessee rumbled through the area and reminded all of us that the San Andreas might be locked and loaded, but the largest earthquakes to hit the continuous 48 states came from southern Missouri. Note the location of these quakes in relation to the actual fault line. 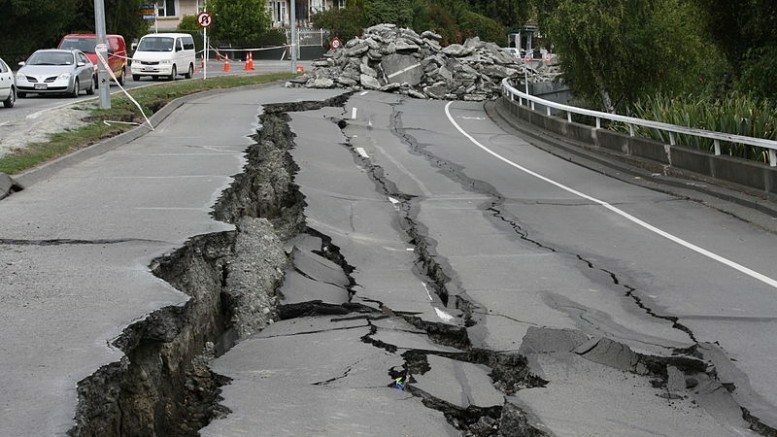 As it happens, this writer is a resident of the New Madrid seismic zone and can testify that small quakes and tremors happen with a fair amount of regularity. Normally, they do not cause much damage, but the last larger one did damage an aging overpass (it is currently being replaced) and in higher buildings, items have been known to fall off shelves. In the image below, earthquakes indicated by red circle is what we in the midwestern river valleys have seen in the last 43 years. How dangerous is this faultline and seismic zone? There are historical accounts of major earthquakes in the New Madrid region during 1811-12. 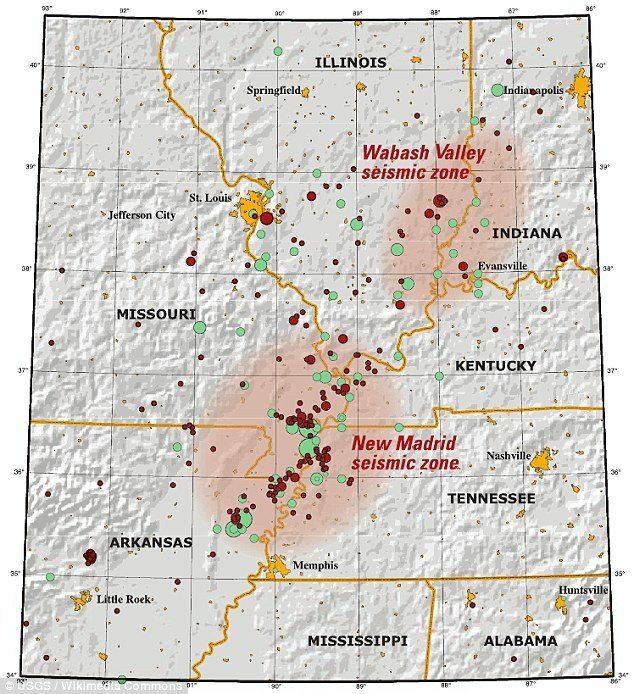 The geologic record of pre-1811 earthquakes also reveals that the New Madrid seismic zone has repeatedly produced sequences of major earthquakes, including several of magnitude 7 to 8, over the past 4,500 years. These prehistoric earthquakes caused severe and widespread ground failures in the New Madrid region, much like those caused by the 1811-12 earthquake sequence. The key evidence for large earthquakes that occurred in the past are sand blows that formed when under¬ground sand and water erupted to the surface as a result of violent shaking. Numerous large sand blows over a wide area were created by strong ground shaking during the 1811-12 earthquakes. Similarly large, widespread, and abundant prehistoric sand blows were produced over the same area during ground shaking from previous clusters of large earthquakes around A.D. 1450, A.D. 900, and 2350 B.C. The sizes and areal distribution of the prehistoric sand blows indicate that the older earthquakes were similar in location and magnitude to the 1811-12 shocks. Just to put it plain: the 1812 quake changed the course of the Mississippi River. Despite the rhetoric within the geology community that maybe the New Madrid Fault is dying, the truth is that all the small quakes and tremors could be signs of either pressure relieving or pre-cursors to THE BIG ONE. One way or another, the fault is still very active…and we in the Mississippi River Valley don’t know when it will strike again.